DOUBLE ADOPTION ANNOUNCEMENT!! 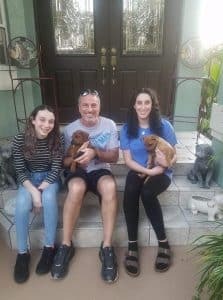 | 100+ Abandoned Dogs of Everglades Florida, Inc.
RICKY & LUCY BROTHER AND SISTER RESCUED FROM THE MIAMI DADE ANIMAL SERVICES KILL SHELTER HAVE FOUND THEIR FOREVER LOVING HOME TOGETHER!! THANK YOU JOSH & FAMILY!! !